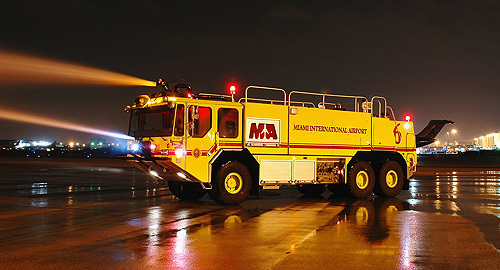 The primary purpose and mission of the Aviation Fire Rescue Division (MDFR) is to provide state-of-the-art fire rescue services to the passengers, employees and visitors of Miami-Dade County airports. The Aviation Fire Rescue Division activities include mitigation of, and response to, structural and aircraft fires, as well as response to medical emergencies, fuel spills, incidents of terrorism, hazardous materials spills, bio-chemical threats, radiological exposures, and natural disasters. Over the past calendar year, the Aviation Fire Rescue Division has demonstrated its preparedness and capability in responding to more than 8,000 emergencies and non-emergencies within its jurisdiction. In order to maintain the highest level of readiness, the Division engages in continuous education and training programs. The Division also develops and maintains dynamic disaster response plans for every potential hazard that may be present in highly complex environments such as Miami-Dade County airports. The Aviation Fire Rescue Division encompasses four major service areas, which include Airport Operations, Training and Safety, Fuel Safety Operations, and Aviation Life Safety (Life Safety Code Enforcement). The Division is responsible to both the Miami-Dade Fire Rescue Department and the Miami-Dade Aviation Department and responds to communities that surround the airport on a Mutual Aid System. The Aviation Fire Rescue Division consists of three (3) emergency response stations. These stations are located as follows: two fire stations at Miami International Airport (MIA) (Station 12 and 59), and one fire station located at Opa-Locka Airport in north Miami-Dade County (Station 25). These stations provide Aircraft Rescue Fire Fighting (ARFF) response to any emergency situation within the required Federal Aviation Administration (FAA) response time of less than three minutes. In addition to the mandatory training listed above, the Aviation Division's Training and Safety Bureau researches and provides training at the Fuel Tank Farm located at MIA, the Miami Intermodal Center (MIC) Rental Car Center, as well as Kendall-Tamiami Executive and Opa-locka airports. This bureau also maintains the external defibrillator program at the MIA terminal, as well all associated training to Miami International Airport (MDAD) staff. This bureau provides training to MDFR District Operations units, which respond to the airport in emergencies. The Aviation Training and Safety Bureau is also responsible for updating all current Standard Operating Procedures (SOP). This includes identifying and developing new SOPs as dictated by technological changes as well as changes within the aviation industry. All these functions are accomplished by establishing and maintaining relationships with all entities at all airport facilities. The Fuel Safety Operations Bureau conducts inspection of fuel delivery systems including fuel trucks, fuel hydrants, hydrant carts and the tank farm. In addition, the bureau conducts investigations of fuel spills and other accidents for code compliance. The Aviation Life Safety Bureau is responsible for plans reviews, life safety inspections, Certificate of Occupancy inspections, and code compliance efforts for Miami International Airport, Kendall-Tamiami Executive Airport, Opa-locka Airport, Homestead General Aviation Airport and Dade-Collier Training and Transition Airports in Miami-Dade County. (This bureau is supervised by the MDFR Fire Prevention Division, which is led by our Fire Marshal). For further information visit Miami-Dade County Fire Rescue Department.